Shopping in Biarritz is a delight, whether you are looking for Basque textiles, the latest surf gear, exceptional Biarritz chocolates, designer labels, quality jewellery or antiques. Intimate boutiques and large department stores will quickly fill your suitcase, whatever your budget! 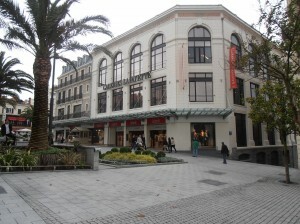 In Biarritz, major boutiques with big designer names from Paris can be found on Place Clemenceau (Galerie Lafayette) in the centre of Biarritz, as well as along the elegant rue Mazagran and avenue Edouard VII ( Hermes & Gerad Darel ). All the world’s surf wear labels, including surf wear gurus Quiksilver, Roxy, O’Neill and Billabong, can be found in the many surf shops by Grand Plage Beach and around Place du Port Vieux. Whether you are a surfer or not, you can certainly look the part! Virtually every souvenir shop and department store in the region sells espadrilles, the canvas-topped, rope-bottomed Basque shoe. You will be amazed at how many colours and styles an espadrille comes in! With your feet adorned in traditional Basque footwear, add a red Basque beret to complete your authentic outfit! The indoor food typical French market at Les Halles offers the Biarritz’s speciality, fresh curd sheep’s milk, as well as sausages, cheese, Serrano ham, fresh herbs, freshly caught sardines, fresh fruit and vegetables, and other local Basque delicatessen treats.